(Nanowerk Spotlight) The automated analysis and detection of minute quantities of substances in biological samples has become such a routine practice in clinical and analytical laboratories that nowadays high-throughput screening (HTS) systems allow researchers to quickly conduct millions of biochemical, genetic or pharmacological tests. HTS heavily relies on sophisticated strategies to miniaturize the devices, in particular the central part of any biosensor - the sensing surface. Here the biomolecular interaction takes place and the binding event is transduced into an opto-electronic signal. The phenomenon behind many color-based biosensor applications is the excitation of surface plasmons by light - called surface plasmon resonance for planar surfaces or localized surface plasmon resonance (LSPR) for nanoscale metallic structures. Surface plasmon resonance of metallic nanoparticles, in particular gold, has become a popular nanotechnology-enabled technique to build increasingly sensitive and fast biosensors. All the nanostructures used for the biosensing applications have two characteristics: Firstly, they contain certain recognition mechanisms specified to the analyte, for example antibodies or enzymes. Secondly, they are able to generate a distinguishing signal from the analyte and this signal could be generated by the nanostructures themselves or produced by signaling molecules immobilized or contained in the nanostructures. However, proper functionalization remains an issue when it comes to real-world applications, in particular, biological relevant samples such as membrane associated proteins and peptides. Researchers in Germany have now demonstrated that membrane-coated nanoparticles offer the advantage of suppressing unwanted nonspecific interactions because of the presence of the membrane, while providing an extremely small active area. "Membrane coated plasmonic nanoparticles provide a sensing platform that combines single particle sensing with a perfectly functionalized native coating" Jan Becker tells Nanowerk. "In this way, nanoparticles can serve as reporters for cellular reactions taking place on and within biological membranes." Becker, a PhD-student in the Nanobiotechnology Group at the University of Mainz, Germany, is co-author of a recent publication in Nano Letters that describes the group's nanoscale sensor platform ("Protein–Membrane Interaction Probed by Single Plasmonic Nanoparticles"). The small bacterial protein streptavidin is commonly used for the detection of various biomolecules and it binds with high affinity to the vitamin biotin. The strong streptavidin-biotin bond can be used to attach various biomolecules to one another or onto a solid support. The researchers in Mainz, a collaboration of the groups of Prof. Andreas Janshoff and Prof. Carsten Sönnichsen, demonstrated their sensor by detecting streptavidin binding to several membrane coated particles (the membrane displayed biotin moieties) in parallel by monitoring the spectral shift using a fast single particle spectroscopy (fastSPS) method. This approach allows for local analysis of protein interaction with biological membranes as a function of the lateral composition of phase separated membranes. "Since the resonance wavelength of gold nanorods depends on the refractive index of the local environment these particles can be used as bio-molecular sensors" Becker explains. "Coating the particles with a membrane (4 nm in height) changes the refractive index in the local environment from n = 1.33 (water) to n = 1.5 (membrane) and therefore the plasmon resonance is shifted. The second step is to detect the binding of streptavidin to the biotin which is embedded in the membrane. This streptavidin binding results in an additional height increase of 2.3nm (also with a refractive index of n = 1.5) and therefore causes a second spectral shift." Becker points out that, due to the high functionalizability of these membranes – there are plenty with different headgroups commercially available – this is an ideal characterization tool for biomolecules. So far only few studies have reported on particles successfully covered with lipid bilayers. This is mostly due to the challenging task of properly adjusting parameters such as membrane curvature and adhesion properties. 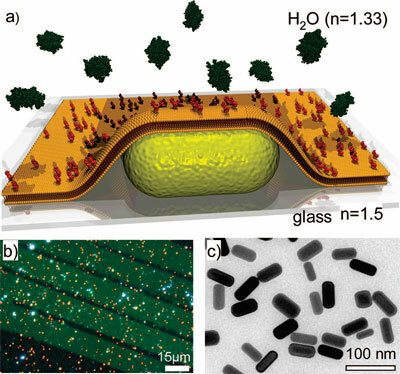 Becker and his collaborators are also the first reporting on membrane covered (gold) nanorods. "Compared to spherical gold nanoparticles, gold nanorods show much higher sensitivity to changes in the refractive index and therefore are much more suitable for sensing applications than the spheres" says Becker. The team believes it will be conceivable to create sensors based on the detection of equilibrium coverage fluctuations that would circumvent problems arising from mass transport and drift of the sensor signal. They say that, as a consequence, complex processes such as cooperative adsorption, adsorption to heterogeneous surfaces, and slowly evolving systems can be addressed by fluctuation analysis. A specific implementation of this work could be to reduce the exposure time to capture the spectra of nanoparticles in biosensing applications. According to Becker, at the moment the exposure time is typically 30 seconds. "Reducing the exposure time would offer the possibility to investigate the spectra of the particles continuously with a high temporal resolution. Therefore single binding processes could be investigated and statistical calculations could be performed."